This sort of thing has been going on for seemingly ever – real estate for sale that’s basically unobtainable – but it’s never stopped anyone from trying and believe it or not, it’s a profit-making enterprise. Take, for example, LunarLand.com. 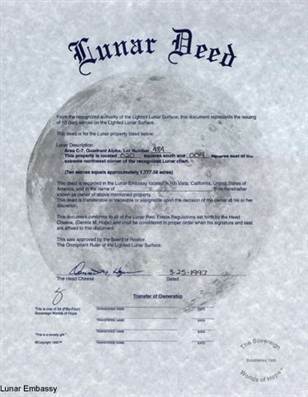 Since 1980, they’ve been selling offworld prospectors lunar property one acre at a time. And why not? Just about everyone, and I mean everyone, has endorsed them. A quick trip to their website tells you that over 250 celebrities have snapped up lucrative tracts of land, perhaps one day to start a development bearing their name. It’s not like it’s a great wad of dough you have to shell out, either. For $29.95, you too can lay claim to a spot of your own, and it comes complete with all the documentation you’ll need. So if some pesky astro-, cosmo- or taikonaut trudges through the breccia on your spot, you have every right to give them the boot or charge rent. So how is this possible? Well, in 1967 a treaty stated that governments can’t own lunar land, but there’s nothing to stop corporations and private individuals from doing so. All property sales are registered with the US Office of Claims Registries, the same office that’s responsible for any land claims. Any government in the world is free to challenge this, but so far, none has. But is it realistic? Can you really hop in your own rocket, blast off and set up housekeeping/shop in a barren world with little means to support yourself in any way, shape or form? Ah, that challenge was faced by those intrepid souls who once trod the lands of this country back in time, not knowing what they’d find or if they’d survive the experience. But somehow life carried on, the land was settled and people prospered. Houses were built, highways grew and shopping malls sprang up like crocuses in spring. So, what are you waiting for! Grab your lunar acreage while the opportunity’s still fresh! « Writing Workshop: Pacing Your Story!